Yesterday was all about cookie dough. I dusted off my mother’s old sisterhood cookbook and got started creaming butter, sugar, and orange zest. Forty minutes later, I was wiping down floury counters as a bowl of dough chilled in the fridge. Today, my daughter and I re-floured, rolled, cut, filled and folded five and a half dozen Hamantaschen, the official cookies of the Jewish festival of Purim. A Persian king had an advisor, Haman who wanted to kill all the Jews and wore triangular hats. The king’s uber-hot and secretly Jewish wife, Esther, and her uncle, Mordecai, foiled Haman’s plans. The secret to good Hamantaschen–the kind that are so good kids don’t discard the corners after they’ve nibbled the fillings–is starting with an excellent dough. I found the recipe I use in an old temple sisterhood cookbook my mother gave me. I could eat the dough by itself. 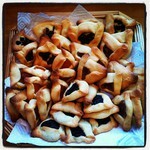 For fillings, Lekvar (prune) is the most traditional, but nobody in my family is really a fan, so for traditional Hamantaschen, we stuck to apricot, poppyseed, and almond fillings. We also made my kids’ favorite: chocolate chips. Yum. Dough, waiting. Hamantaschen in progress.